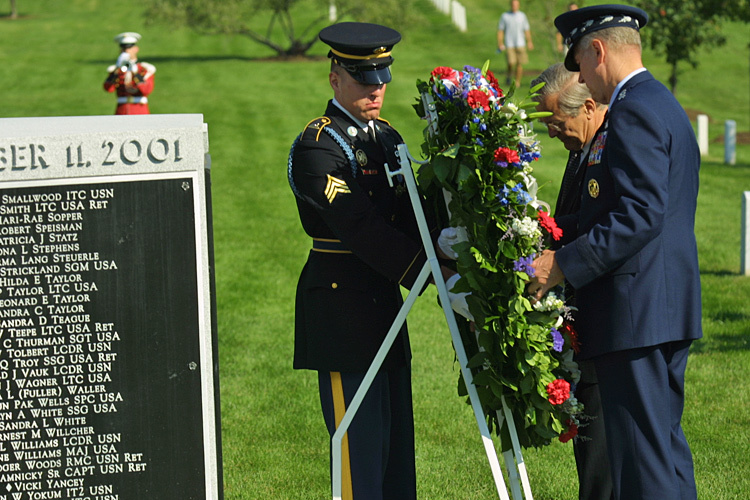 Secretary of Defense, Donald Rumsfeld, and Chairman of the Joint Chiefs of Staff, General Richard Myers, place a wreath at the new memorial to the victims of the September 11th attack on the Pentagon. The memorial is located in the new section of Arlington National Cemetery where the victims of the Pentagon attack now lay in rest. September 11, 2003 - Secretary of Defense, Donald Rumsfeld, and Chairman of the Joint Chiefs of Staff, General Richard Myers, place a wreath at the new memorial to the victims of the September 11th attack on the Pentagon. The memorial is located in the new section of Arlington National Cemetery where the victims of the Pentagon attack now lay in rest.